Improper assembly, which can cause loss of output; e.g., worm-to-worm gear misalignment, thin gaskets, excessive pre-load on housing cover bolts. The units span a torque range of 12.5 to 3,600 ft-lb, with accuracy and repeatable performance across the entire range. This wide range of sensitivity is accomplished by selective employment of pneumatic disk brakes, and by utilizing different load cells to cover the entire torque range. Adapter plates and stem adapters are available for actuators made by Limitorque, Rotork, EIM, Hopkinsons, and others. The actuator mounts on top of the test stand with an adapter plate, and is coupled to the stand by a stem adapter which replaces the actuator stem nut. The stem adapters are not threaded, and there is no vertical travel of the stem in the actuator. Thrust and torque are applied independently and can be adjusted to any level. The loading system applies a constant thrust load via a double-acting hydraulic cylinder. The cylinder provides upward or downward loads to simulate opening or closing valve strokes. The hydraulic load is transmitted to a shaft shoulder through self-aligning roller thrust bearings, and is applied to the actuator by the stem adapter. 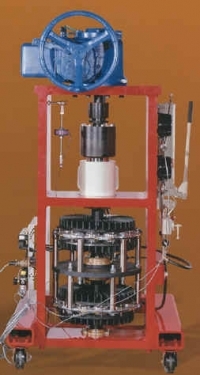 Actuator torque is transmitted from the stem adapter to the test stand drive shaft by a slotted drive connection. A controlled torque reaction is applied to the actuator by varying the pressure to the drive shaft pneumatic brakes. The torque can be varied from zero to the test value within a prescribed time by setting the target torque and time. Stem thrust, stem torque, motor torque, and motor speed are measured using sensors and instruments which are easily removable, and are calibrated to nationally recognized standards.